Overlooking the mighty Mississippi River, the charming pool house—and its adjacent pool—accents the family’s main residence without detracting from it. The pool house is fondly dubbed 3½ Crocus Hill by its owners. If one had to choose a single word to capture its essence, the word would be “discreet.” With its main level at just over 800-square feet, the pool house is not small, nor is the pool, but both sit behind the main residence in such a way as to achieve invisibility. This was a top priority for owners Joe and Anne Keeley, who had long been wanting to install a pool in their spacious backyard. But thoughts of kids running through the home to access the bathroom, dripping water on the dining room’s wood floors, had the couple considering building a pool house as well. Designed with entertaining purposes in mind, the pool house provides plenty of places for guests to gather. The construction process was as unobtrusive as the pool house itself, with the exception of a brief hiatus when the builder, Kareem Reda of Anderson Reda, Inc., made a startling discovery. The original carriage house belonging to the first home built on the lot had featured a turntable (picture a giant Lazy Susan) that allowed carriages to reverse direction before exiting to the driveway. The builder who razed that structure buried it—turntable and all—in the backyard, which saved him the trouble of hauling it away with the rest of the house before putting up the new one. 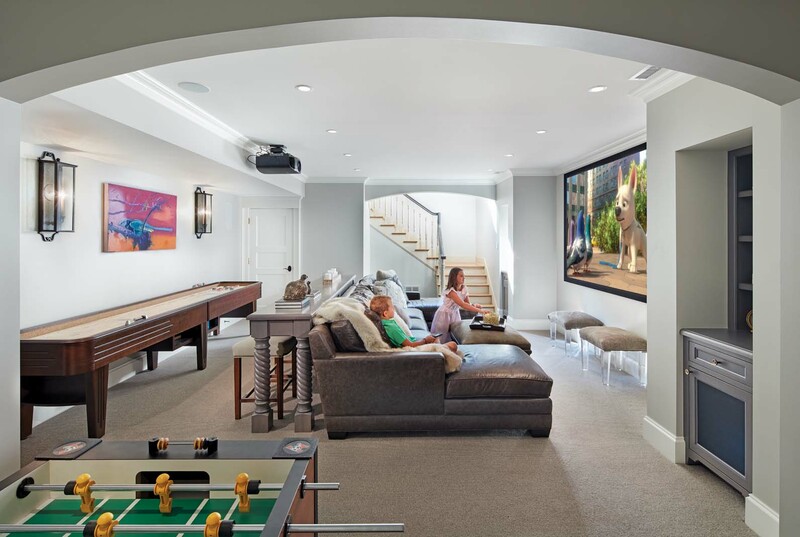 A spacious entertainment room makes up the lower level of the structure, where the family can play games and watch movies together. 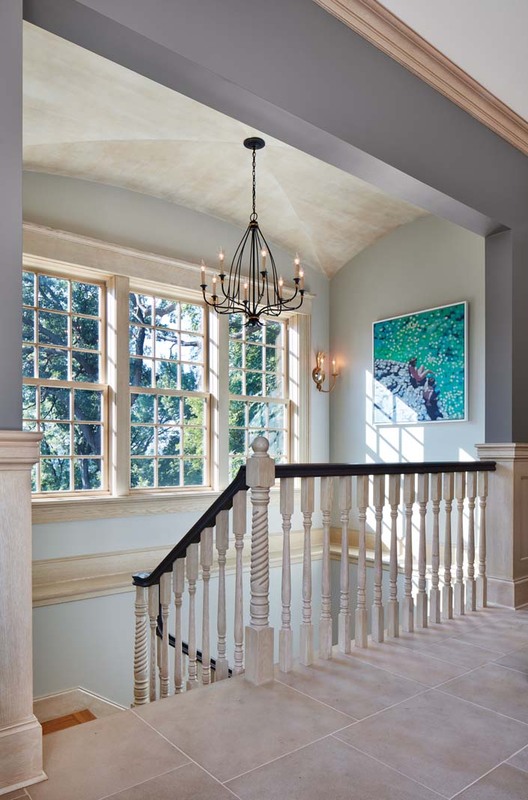 A window by the stairway provides views of the river valley and lets natural light into the lower level. Both the main residence and pool house are Federal in style—simple and symmetrical, with the same slate-shingled hip roofs. But while the main house has an all-brick façade, the pool house is clad in cedar V-groove shiplap siding, painted white. Glass doors lead into a full kitchen, situated so the parents can prepare meals while keeping an eye on the kids at the same time. 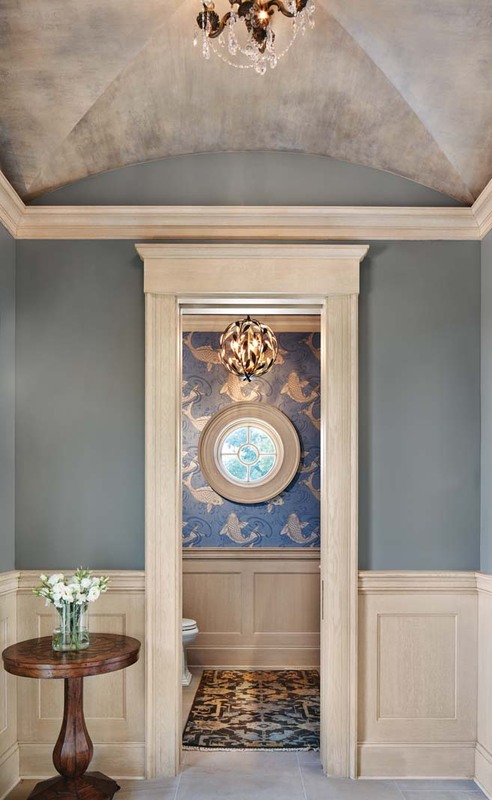 The interior flooring, made of the same pale washed sandstone as the pool deck outside, complements the tawny finish on the white oak cabinets and trim found throughout the elegant structure. The main floor houses a bathroom, changing room, and a full kitchen, which features white oak cabinets with a washed finish to lend a beachy vibe, as well as custom root beer on tap for the kids. 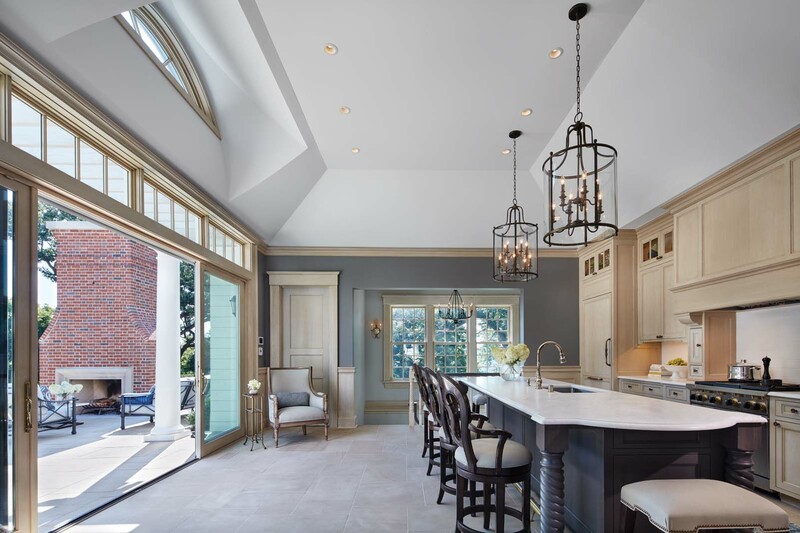 The kitchen floor is made of the same pale washed sandstone as the pool deck, a purposeful design choice that helps bring the indoors out when the glass doors are open. 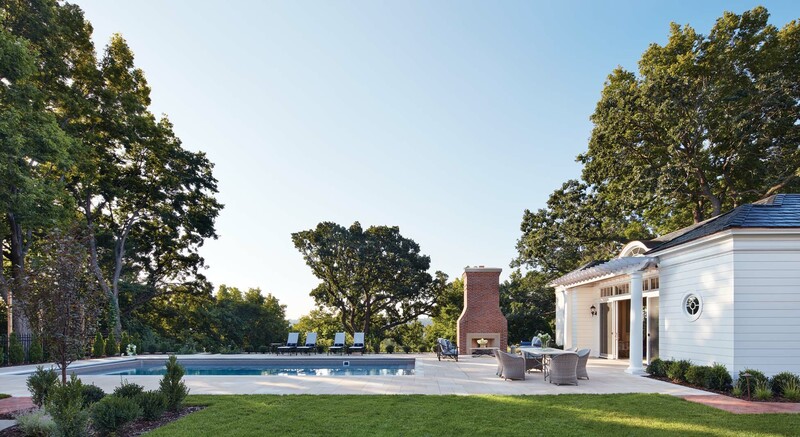 A large outdoor fireplace on one end of the pool lends privacy and cohesion as well, and its brick chimney echoes the warm hues of the main house. In addition to the kitchen, the main level also houses a bathroom and changing room to provide easy access to pool-goers. All these details add up to the sense that the property was always this way, notwithstanding the turntable garage. To erase any hint that the main house is, in fact, relatively new (most of the homes on the block date to the turn of the century), the design team placed metal canopies over the front and side entrances (a detail that was also added to the pool house), as well as an eyebrow window above the pool house doors. Electronic gates—two for cars and a smaller one for people and mail delivery—are supported by sturdy brick piers. “Figuring out how to center the piers involved a lot of math,” Whicher says. That’s because the house is not set parallel to the street, which runs east-west, but to the line of the bluff behind it, which runs diagonal to the street. Mark Foreman of Loco Landscape Design worked with the designers to resolve any visual dissonance this might cause, softening the strict geometry of the house with flowerbeds, trees, and shrubs, installed by Kern Landscaping. Columnar arborvitaes along the iron fence marking the property lines have a similar effect, as do the curvaceous front lawn and half-circle driveway. When perfect symmetry isn’t possible, you can still maintain balance. A pair of identical clipped topiaries on the front stoop complete the skillful sleight of hand, presenting a public facade as formal and reserved as the family of four who live there is warm and fun-loving.